A duck which was stuck in ice next to a canal bank in Greater Manchester has been rescued by firefighters. The bird was spotted by a member of the public in Monton on Thursday afternoon. Fire crews from Eccles were called out and smashed the frozen water around the bird to free her before the RSPCA tried to release her back into the wild. She refused and was taken to Eccles fire station where she laid an egg, before being passed to the Three Owls Bird Sanctuary and Reserve in Rochdale. Station commander Paul Starling said: "This isn't the first time I've been called out to rescue a bird trapped in ice. 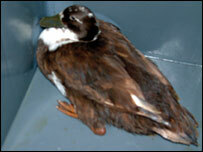 "Unfortunately this duck had been there all night and was very cold and frightened. "A number of people had tried to free her and had given her food before calling us in. "We used a pole to break the ice around her and she then waddled into the middle of the canal so we had to wade in and get her. "She was taken back to the station where she laid an egg and was then taken to a rescue centre so she could be nursed back to health before hopefully being released."